This second edition of Catherine J. Allen's distinctive ethnography of the Quechua-speaking people of the Andes brings their story into the present. She has added an extensive afterword based on her visits to Sonqo in 1995 and 2000 and has updated and revised parts of the original text. 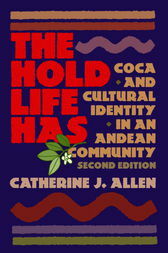 The book focuses on the very real problem of cultural continuity in a changing world, and Allen finds that the hold life has in 2002 is not the same as it was in 1985. Catherine J. Allen was the recipient of a 2001 Guggenheim Fellowship Award and is professor of anthroplogy and international affairs at George Washington University in Washington, DC. She is the coauthor with Nathan Garner of Condor Qatay: Anthropology in Performance (1996).